Tags are keywords that you can give to artefacts and pages in your portfolio to find them more easily later on. The more you use a tag for your files, journal entries and pages, the bigger its font size in the tag cloud. You can click on any tag and filter the artefacts and pages you have for it. The number in parentheses tells you how many times a tag occurs in your resources. Sort results by: You can sort the results by their name or creation date. Filter results by: You can filter your results by specific artefact types or just show portfolio pages. 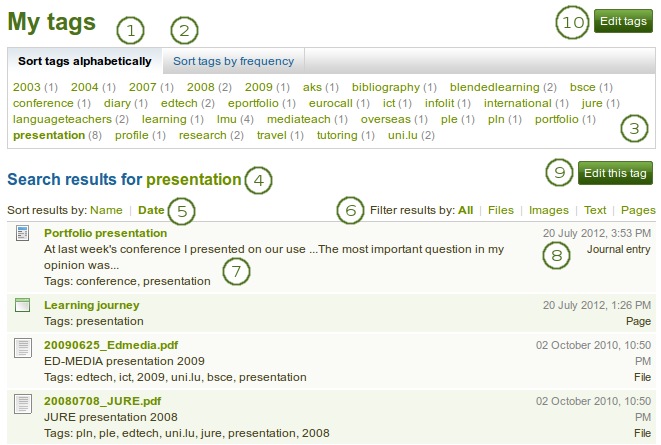 The title of a resource, its description if available and its associated tags are displayed. The creation date and time as well as the type of resource is shown. Click the Edit tags button to make changes to your tags. Select a tag to edit: Select the tag that you want to edit. Once you have selected your tag, it is highlighted in bold in the list and two new boxes appear. You can also click on the My tags button to be taken back to the overview page of all your tags and their associated resources.